Richard Thompson has been described as one of the Top 20 guitarists of all time. He's a songwriter as well as a guitarist, and has written songs that have been performed by an amazing range of stars including Bonnie Raitt, Robert Plant, Sandy Denny, Elvis Costello, David Gilmour, REM and many more. He's won an Ivor Novello award, won a lifetime achievement award from BBC Radio, and Mojo's Les Paul award, amongst other achievements. 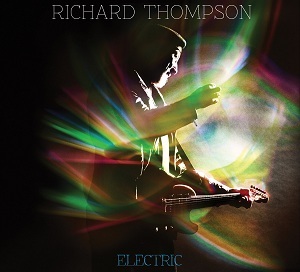 While many guitarists release their solo albums as instrumentals, Richard Thompson takes the other route - bringing in singers to work with, which means you get proper songs rather than a series of instrumentals. On this album he is joined by guests including Alison Krauss and Siobhan Maher Kennedy as well as fiddle player Stuart Duncan. The album is being released in three versions - the standard CD, deluxe 2 disc CD, and Vinyl. As the title suggests, the album is recorded using electric guitar rather than acoustic. The album opens with "Stony ground" which really does feel like a good folk song, but with the usual acoustic guitar replaced by electric guitar. That folk sound and folky sounding vocals contrast with the lyrical content which is darker and grittier. "Salford sunday" starts with some lovely guitar work. It's a slowish song that's got a nice laid back feel to it, with the guitar and vocals being the focus of attention, and the drums kept quite low in the mix. While you expect (and indeed need) some variety between songs on an album to keep it interesting, it's rare that you get as much diversity as you do here. Every song has a different sound, so there really is an amazing variety of songs here. Despite the diversity though, there is a common link to them all - the superb guitar work is what holds things together and makes this feel like a proper album rather than a random collection of songs. This is an album that did surprise me - I really hadn't expected so much variety, or for the album to sound as good as it does. This really is an excellent album that features some superb guitar playing but done so well that it always feels to be an integral part of the song rather than what can happen which is that the song feels like it exists only to tie together guitar solos. A great album that is well worth a listen.